There are a variety of problems that can arise unexpectedly with pipes,	including stoppages. Stoppages can happen in pipes anywhere in home and	are typically caused by the buildup of hair, natural oils, and other substances	such as soap and toothpaste. 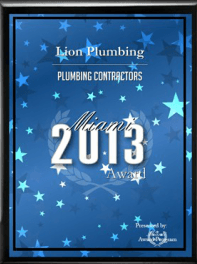 At	Lion Plumbing, Inc., we have extensive experience repairing stoppages. We can even provide	you with re-piping, if this type of service necessary. It is very important to call a professional plumber when any type of pipe	issue arises. Our team has	more than 30 years of industry experience, and	we are available 24/7 for emergency plumbing services. Call us today at (305) 597-4555! We serve Miami-Dade and Broward counties.